Of course black is beautiful, but sometimes a plain black video game console can seem kind or tired and boring. Sony and Microsoft occasionally sell special limited edition consoles at premium prices. But the folks at Skin My Console know how to make your console say something about you and your style at a price anyone can afford. The only shop sells dozens of colorful vinyl skins that feature popular characters, graphics and brands to fit the Xbox One or PlayStation 4. The Skinners use official graphics from games, movies, television shows and products to cover the console and dress up controllers. The selections include the hot shooter games like Halo, Call of Duty and Gears of War plus Diablo, Assassins Creed, Super Mario and Final Fantasy VII. Film and TV characters include Spongebob, Spider-Man, Minions and the crew from Toy Story. Looking for something a little more unusual? Skin My Console can dress your gear in wood grain, flannel, solid red or cannabis leaves. It can even make a PS 4 look like the original PlayStation. Also, the vinyl is easy to remove, so when you change your style you can also change your box. The skins cost about $16 and can be ordered at the Skin My Console website. 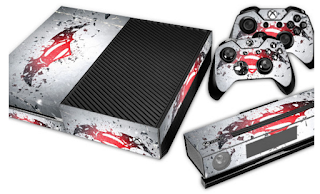 You can also keep up with new designs and offer your own ideas @skinmyconsole on Twitter.